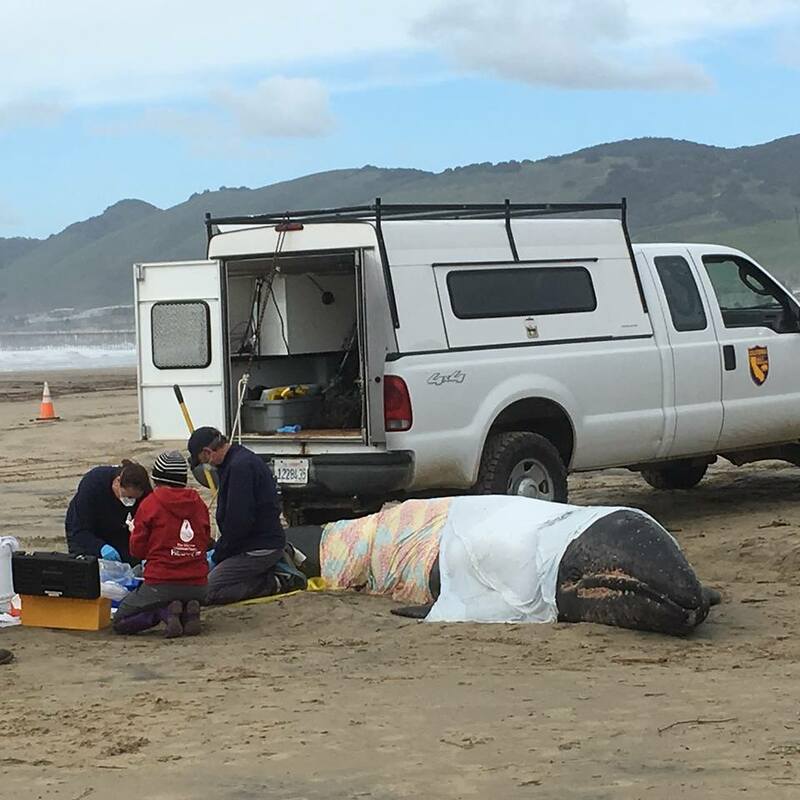 A gray whale calf died Tuesday, hours after washing ashore on Pismo State Beach near the Monarch Butterfly Grove. Passersby noticed the whale around 7 a.m. Officials from state and federal agencies then came out to the scene, as did numerous onlookers. Video footage shows the whale calf was alive and flopping on the ground. But, no one moved the mammal back into the ocean. The whale died around noon. Officials said the whale was about 15 feet long, and it weighed about two tons. Diana Kramer, of the Marine Mammal Center, told KSBY it was best not to drag the young whale back to sea and that doing so could have made matters worse. The whale calf could have drowned, or it might have been in need of its mother’s milk, Kramer said. Two days before the whale died, 42,000 gallons of sewage spilled in San Luis Obispo. The sewage drained into San Luis Obispo Creek and then flowed into the ocean, prompting public health officials to issue a warning against coming in contact with ocean water. It is unclear if the whale came in contact with any effluent. Officials have not determined what caused the whale to wash ashore. First a zebra, then a whale! What next? Marine animals die every year and wash up on the beaches nation wide. Nature is doing what nature does, culling the weak and sick. Question: How much did this necropsy cost us? All “fat jokes” aside, I don’t know too many people that could move a 15-foot, 2,000-lb. object lying in the sand… Did we at least scavenge any useful materials from the animal? (blubber, meat, skin, etc.). Or do we just blow them up and cart them off? correction: two tons = 4,000 pounds. I hope your blowing up comment was made in jest? If not youtube, Oregon beach whale blown up 1970. Did NOT end well. Maybe whales too should not swim in the water after the coastal sewage gets storm flushed to sea?